Miner’s Day celebrates Park City’s mining heritage. Starting in the 19th century and continuing until just a few decades ago, Park City was an ore rich silver mining town. 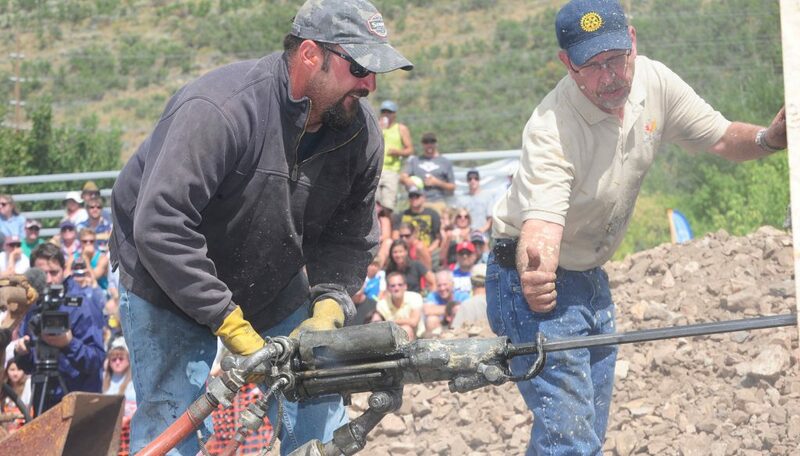 One of the highlights of the annual Miner’s Day celebration is the Mucking and Drilling competition. Competitors come from around the mountain west to compete in timed events that simulate the demanding work done in Park City’s silver mines. Mucking is a tricky event, with competitors operating heavy equipment to load much into a bucket under the watchful eye of a timer. Muck is the broken up ore that comes from drilling and blasting. The mucking competitors quickly load that ore into an ore cart and dump it as quickly as possible. Back in the early days of our silver mines, those ore carts were loaded by hand, shovel load after shovel load. Over time, hand shoveling was replaced by the mucking machine which looks like a mini front end loader on an oar cart. You can watch the skills of the competitors as they size up how to attack the oar pile. Drilling is an intense, high energy event with competitors manhandling a huge drill and hoses, putting every ounce of muscle, strength and sweat into their timed attempt. The drilling event requires putting two deep holes into a slab of rock in the shortest time. The competitors use a large compressed-air hammer drill. This tool requires a tremendous amount of strength, balance, and technique. Competition begins at 2:00 p.m. – get there early to score a bleacher seat. No cost – come by and enjoy a bit of Park City’s heritage. Venue is located in City Park across from the library and adjacent to the skateboard bowl.